You may have noticed by now that we're a little obsessed with all things Star Wars at techradar towers, so when Sky offered us the first glimpse of its new Star Wars themed remotes we jumped at the chance faster than a stormtrooper onto a Rebel blockade runner. The new range of remotes for the Sky+ box have been unveiled to celebrate the return of all six Star Wars movies to their own channel - Sky Movies Star Wars - which will also be playing host to a live broadcast from the premiere of Star Wars: The Force Awakens. There are 10 versions of the remote control to choose from - and although we were quick to judge the Christmas themed Now TV boxes, we're definitely okay with the various designs on display. 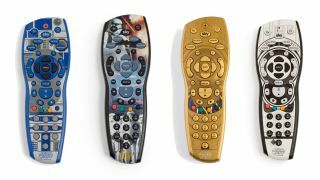 Our favourites are, obviously, the remotes that are designed to look a bit like the characters they represent - iconic versions of C-3PO, Darth Vader, the stormtrooper and the amazing R2-D2 remote. But there are also six art design versions for the likes of Yoda, Han Solo, Princess Leia, Luke Skywalker, and second versions for Vader and the stormtrooper to (jack)boot. And if you're in the US or Australia - we're sorry... Maybe someone else will do their own versions. Sky Movies Star Wars will be available on channel 304 starting December 11 until January 3, and also available to watch via Sky Go.